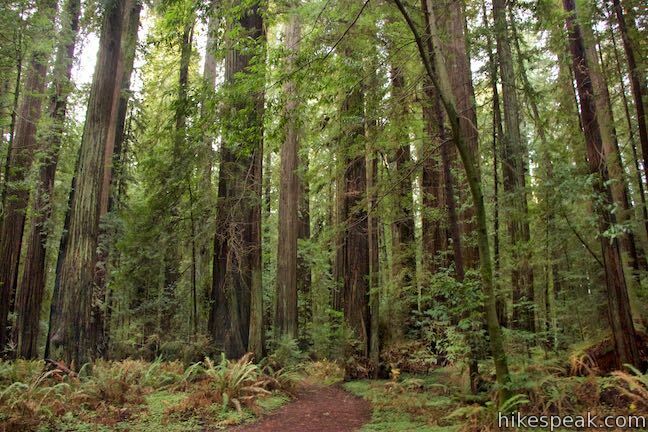 Drury-Chaney Loop Trail (also known simply as Drury-Chaney Trail) presents a easy and well graded hike through redwoods in Humboldt Redwoods State Park. 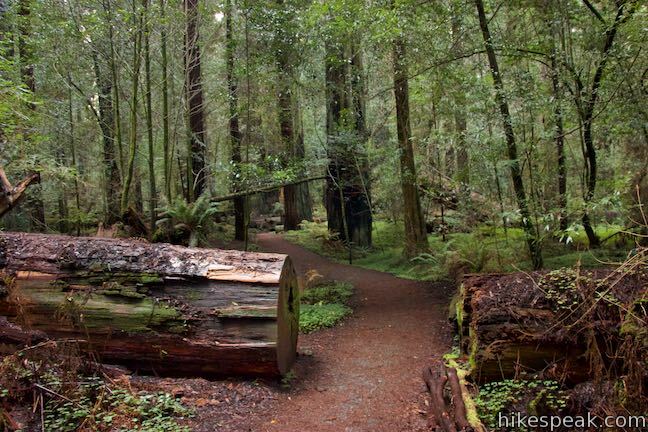 The trail is a lollipop loop suitable for wheelchairs and strollers, crossing a surface of compact gravel with 100 feet of elevation change. 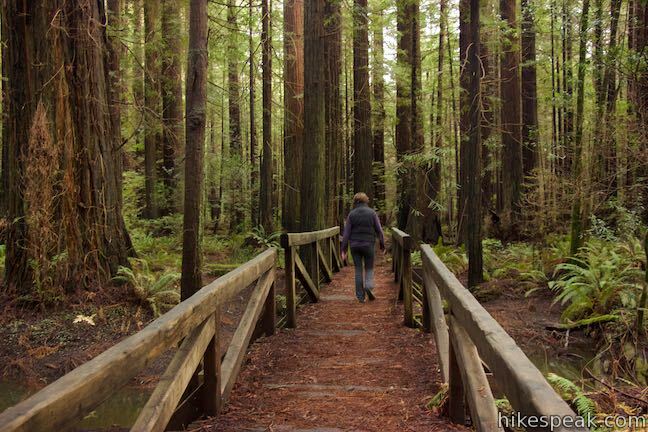 The 2.4-mile length of this hike splits neatly into three sections: a 0.8-mile long access trail to the loop, a 0.8-mile loop, and a 0.8-mile return to the trailhead along the access trail. 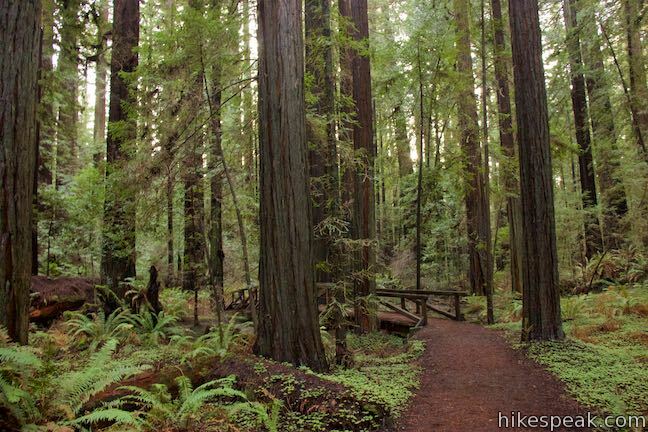 Practically every inch of the trail is lined with sorrel and ferns that thrive below the redwoods. 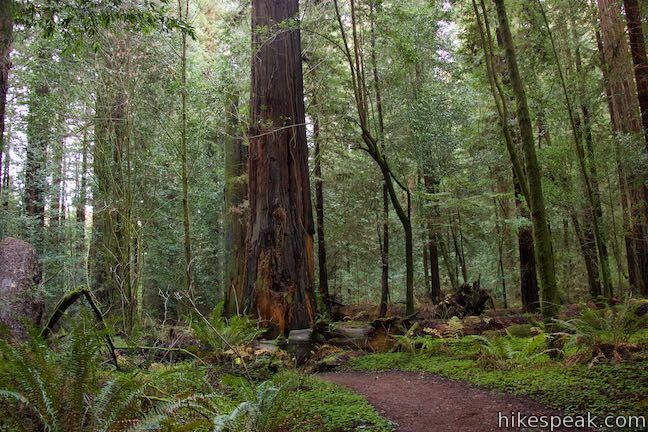 Many of the coast redwoods in the surrounding area are new growth that were planted after logging, but you will discover numerous giants along Drury-Chaney Loop Trail. 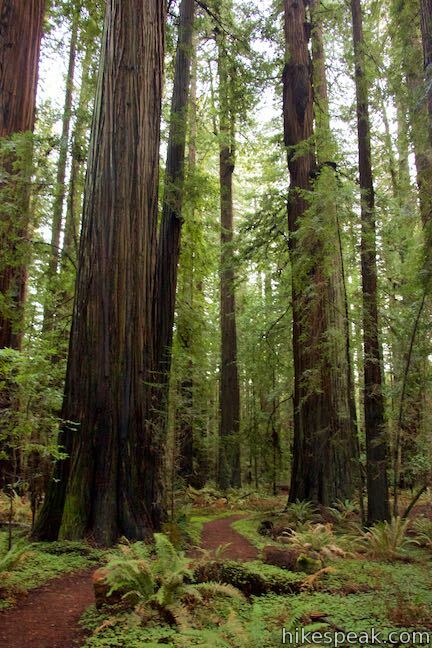 Begin from a parking area along Avenue of the Giants, the main scenic road through Humboldt Redwoods State Park. 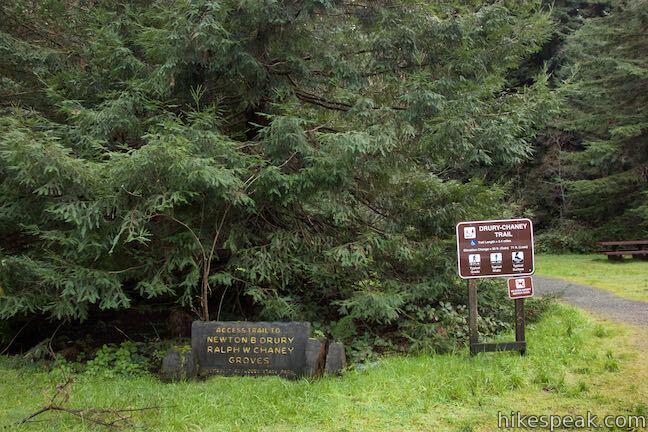 The trailhead is at the north end of the park next to a sign by the road for the town of Pepperwood to the north (population 50, elevation 200 feet). 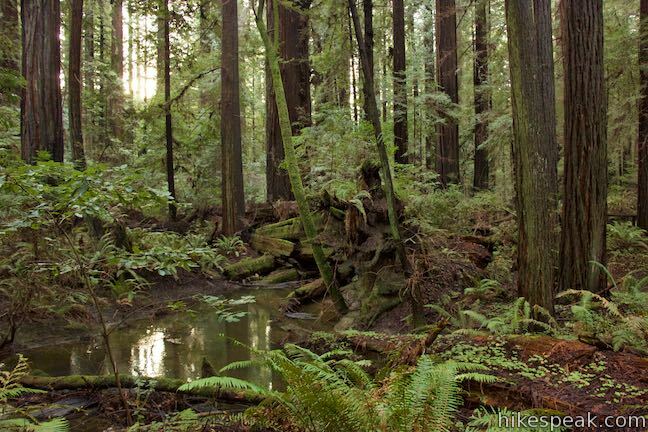 The Eel River is just to the east of the road and the Eel River Valley seems to provide a conduit for coastal fog that brings moisture to the area, creating a lush abundance of ferns and sorrel. 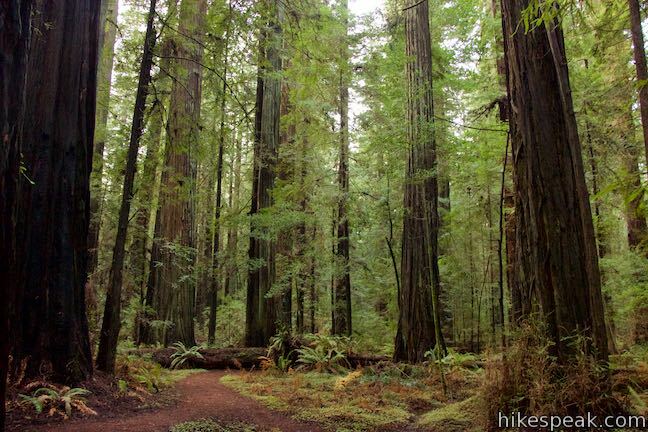 One hundred feet years ago, when Europeans first arrived in this area, the redwood forests seemed endless. 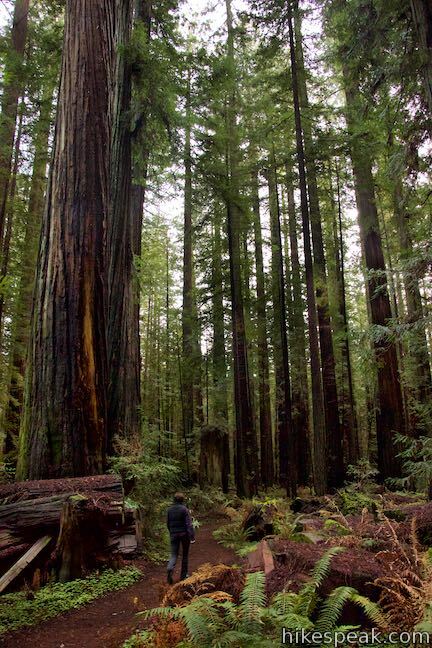 Hundreds of thousands of acres were cleared for housing, commercial forests, agriculture and highways. 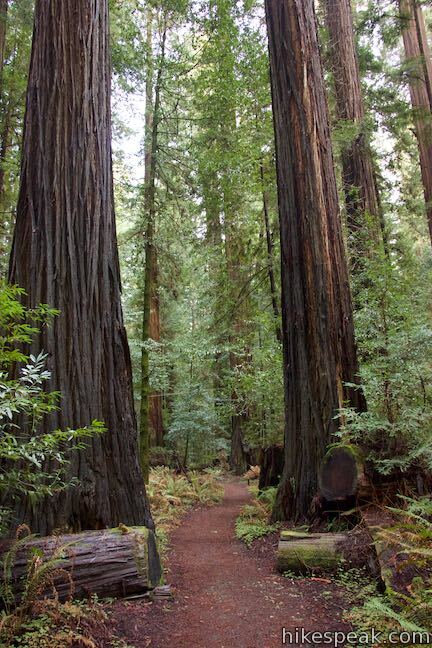 Since the 1980s, California State Parks and Save-the-Redwoods League have been acquiring these altered areas adjacent to the park and replacing them with redwood seedlings, thereby attempting to restore the landscape to a more natural forest condition. 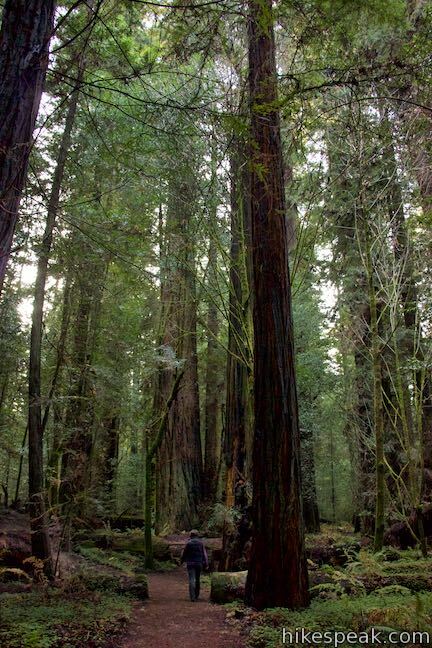 Redwood seeds are gathered within the park to insure genetic purity, then grown for two years under controlled conditions before being transplanted to these open areas. 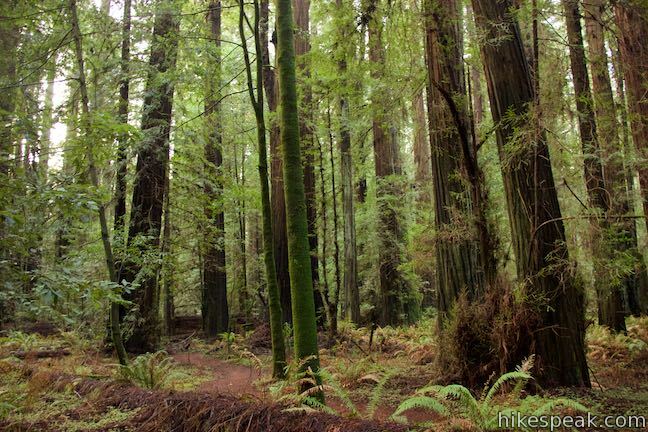 The trees you see on the east side of the Avenue were planted in the mid 1980s and are quickly becoming an established forest. 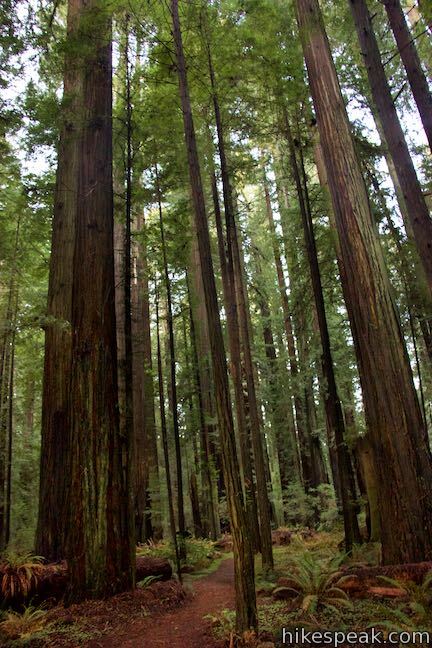 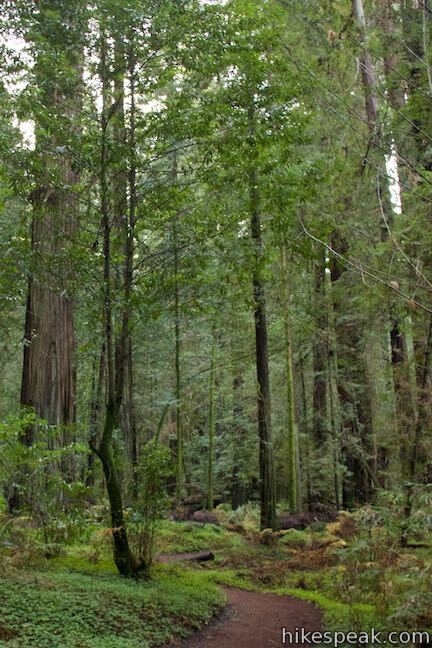 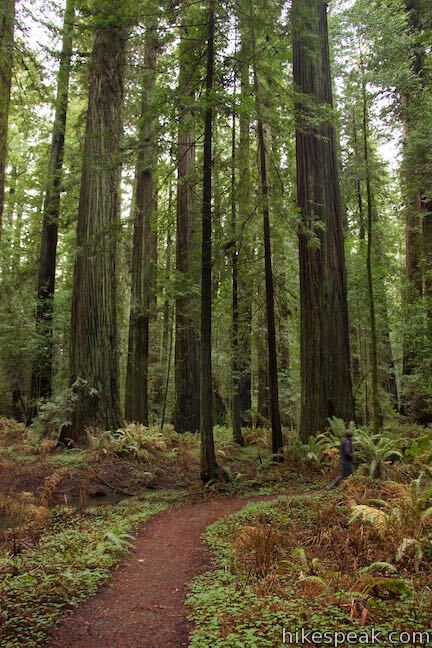 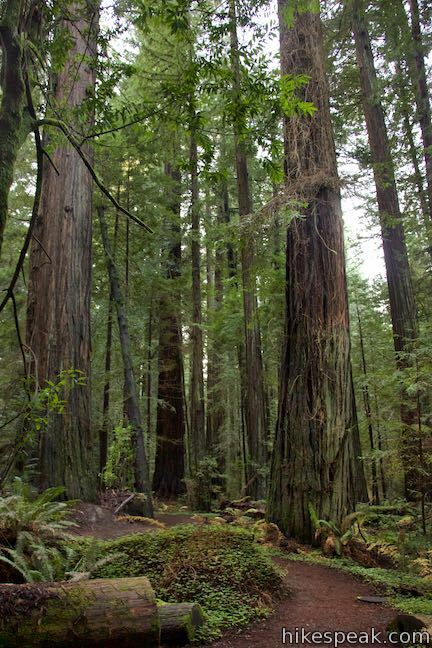 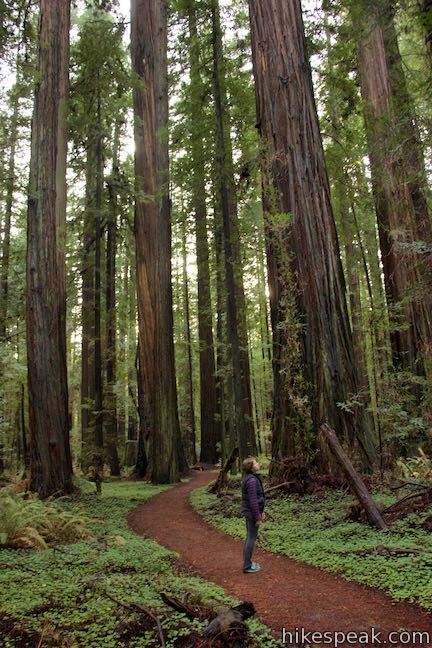 Through donations from the Save-the-Redwoods League, over 50,000 trees have been planted at Humboldt Redwoods State Park, with more planned for the future. 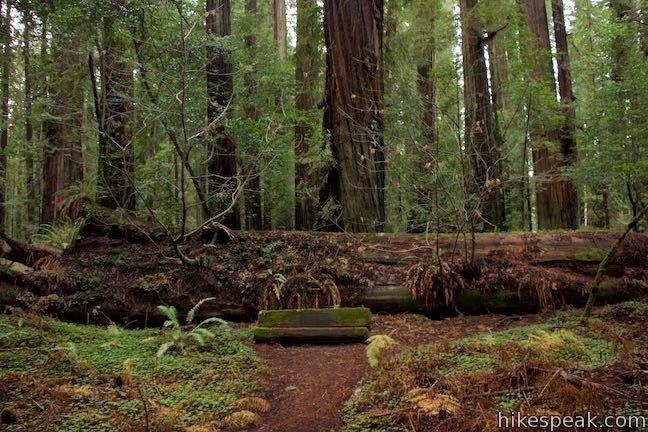 Set out on Drury-Chaney Loop Trail, which passes a bench and a pair of picnic tables in a small grassy area before entering the redwood forest. 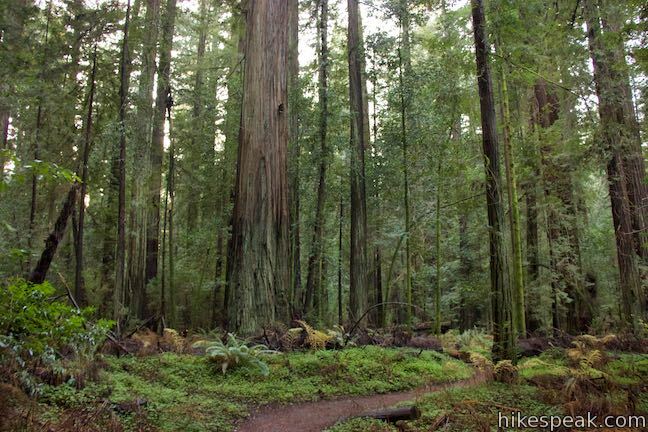 The trail turns to the left and curves around a gully below tall redwoods. 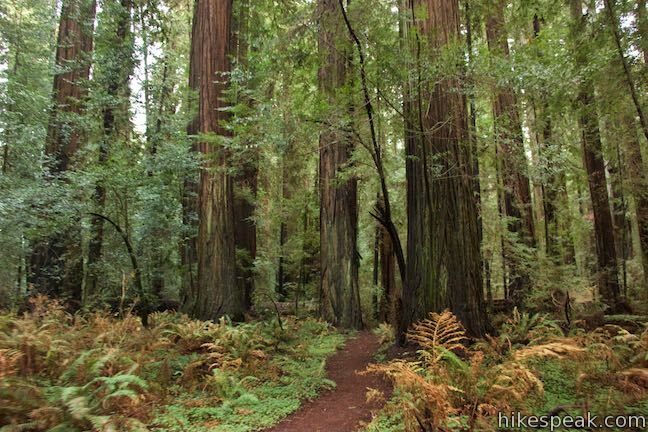 While you’ve only left you’re vehicle, the trail has already entered an enchanting forest. 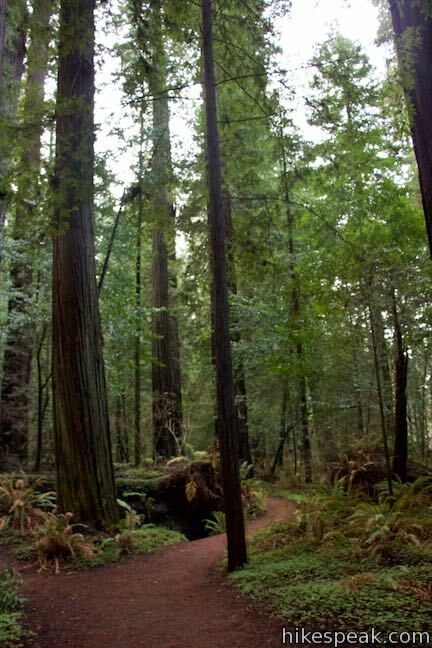 Drury-Chaney Loop Trail finds its bearings and heads west. 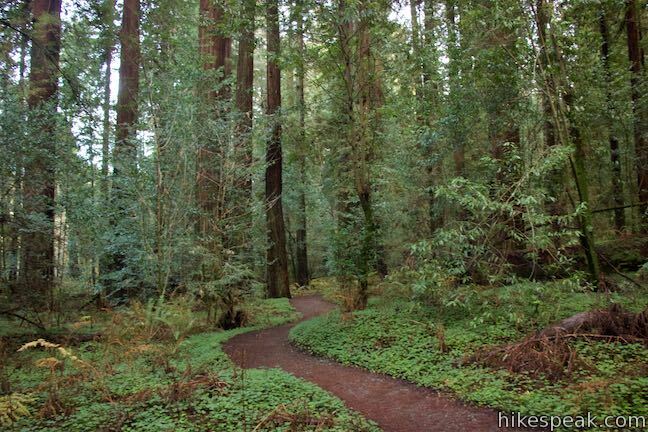 Redwood sorrel and ferns cover the forest floor along the trail. 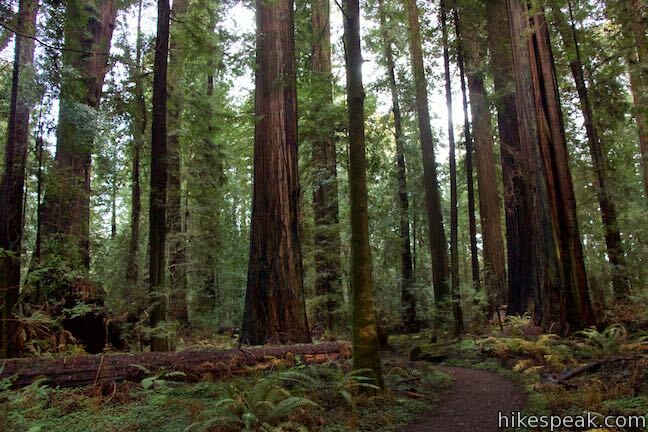 Oaks and huckleberry grow in the understory, gathering what little sunlight they can below the towering redwoods that dominate the forest. 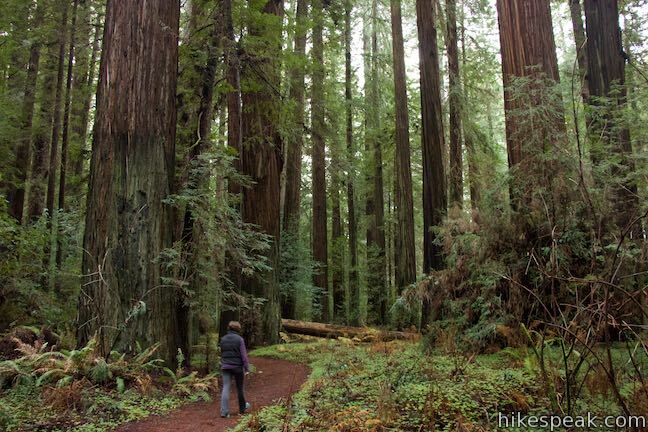 Many of the redwoods along the trail are younger, resembling traditionally sized trees, but some are truly massive. 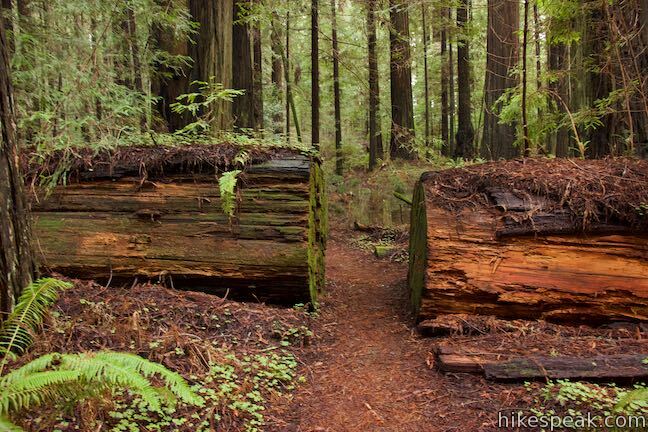 After half a mile of hiking, you’ll pass a bench cut into a log on the left side of the trail. 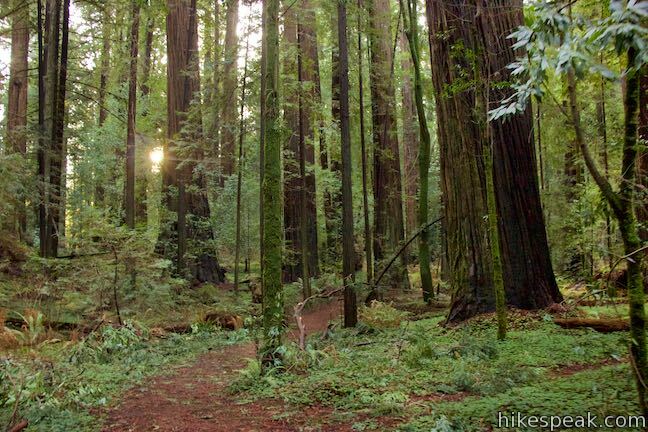 This is a nice place to linger in the forest. 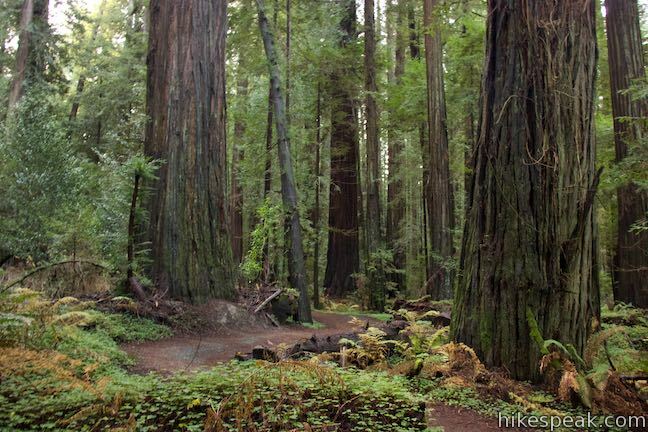 Proceed through the redwoods up to an intersection with a narrow dirt road, labeled as “Gated Park Access Trail” on the map posted at the trailhead. 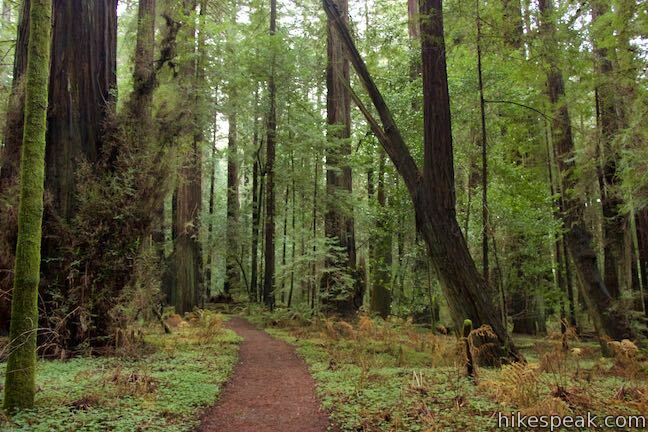 Walk straight through the junction, 0.65 miles from the start, to stay on Drury-Chaney Loop Trail. 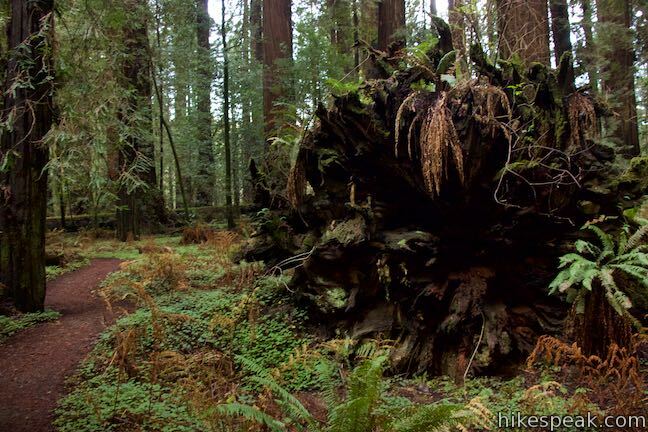 As the trail approaches the start of the loop, it curves to the left and passes the bottom of a once grand redwood tree that has fallen onto its side, exposing a wall of upturned roots. 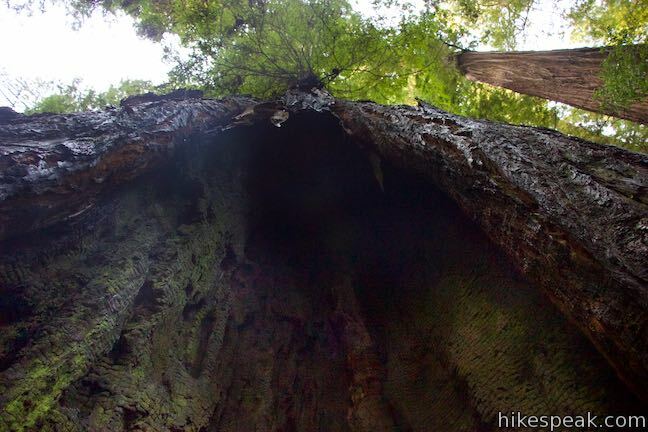 Just after that is a still-standing redwood that was badly burned by wildfire, creating an alcove in the tree large enough to step inside. 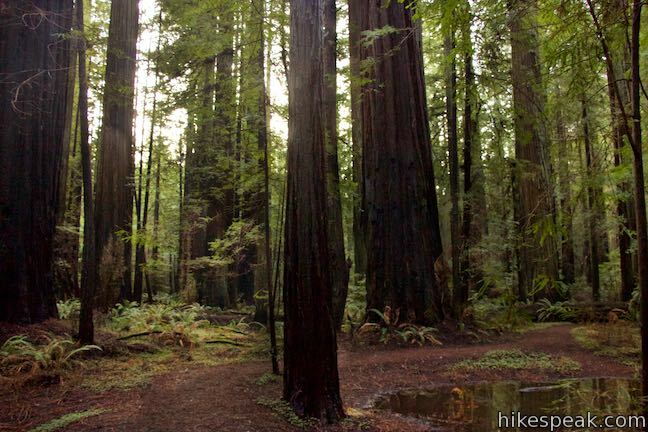 Walk along the trail to the right of a seasonal stream and some standing water next to the upturned roots of fallen redwoods. 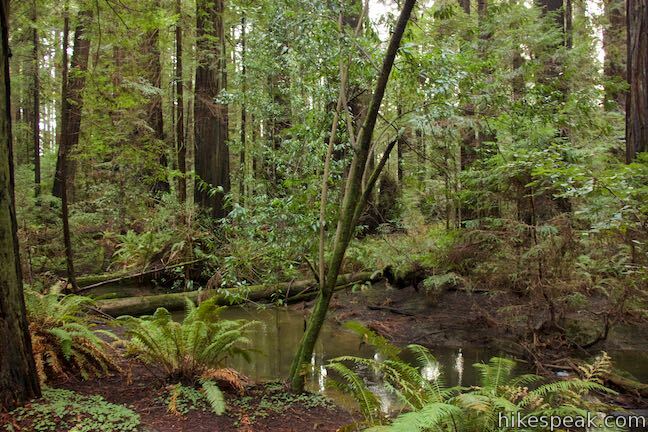 Ferns cover the landscape, which takes on a prehistoric feel. 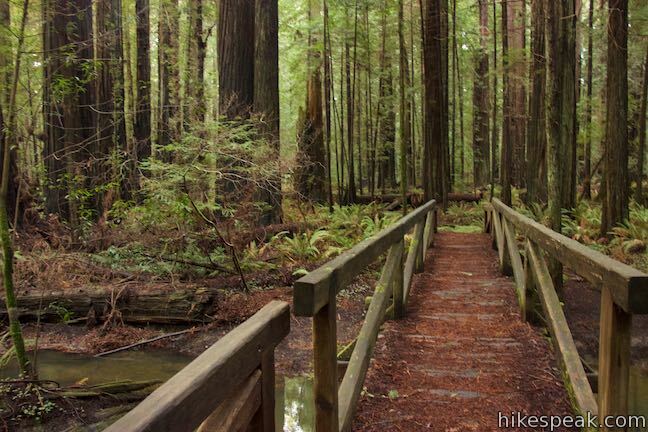 At 0.8 miles from the start, you will reach the start of the loop, posted with a simple sign reading, “loop trail.” One of the loop’s two wooden bridges can be seen up the branch of the trail to the left. 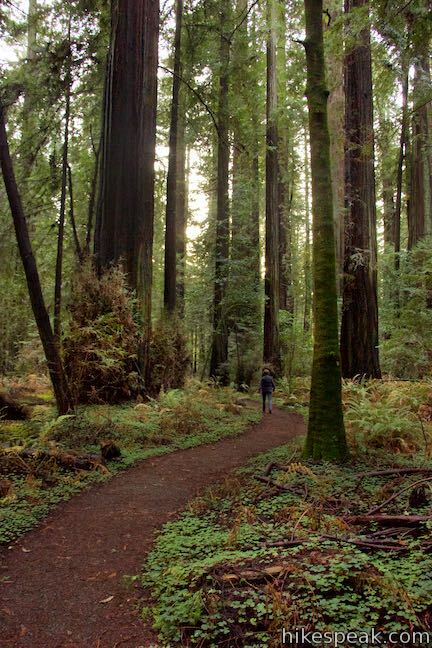 You can head in either around the loop and you won’t hit a junction again until you return to the start of the loop, making it impossible to get off course. 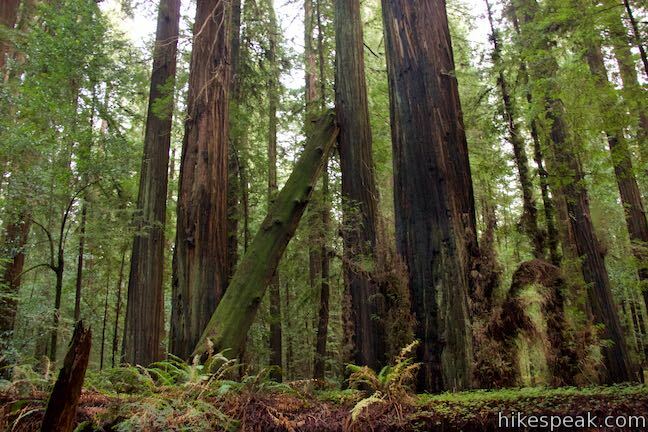 These directions will describe the loop in a counterclockwise direction, assuming that you turn right to begin the loop. 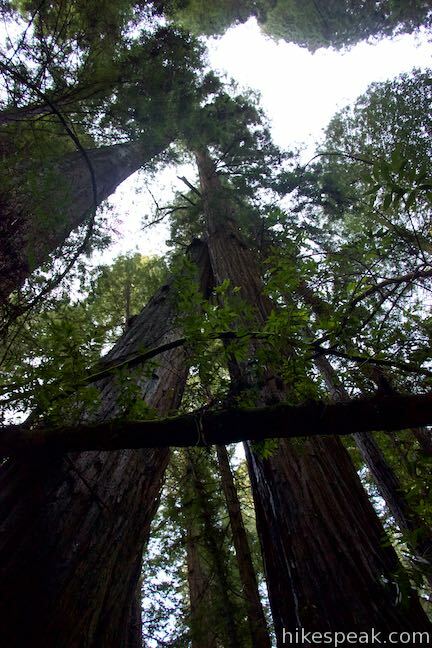 As you walk through the redwood grove, the ferns on the ground will draw your attention, but don’t forget to look up. 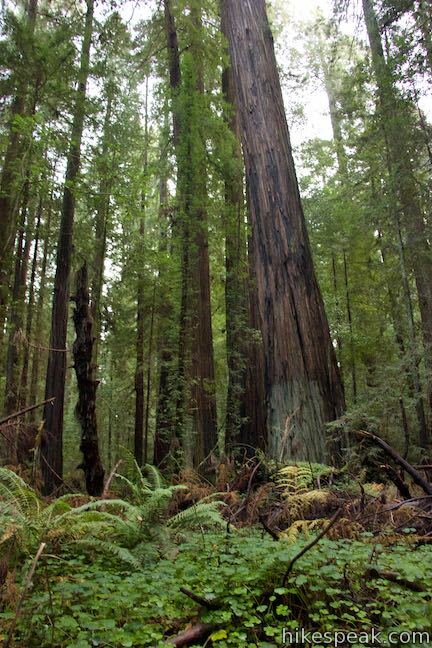 The coast redwood standing next to you may be over 100 yards tall. 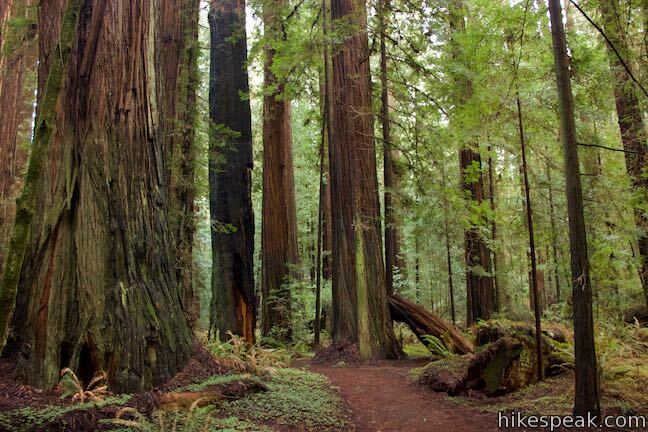 Coast redwoods can live to be over 2,000 years old. 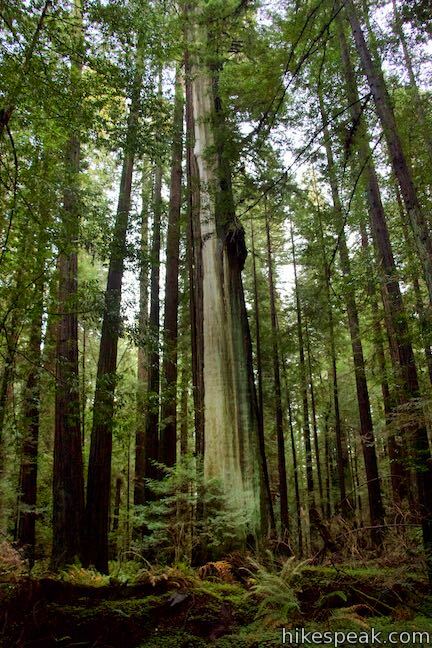 The old growth giants along Drury-Chaney Loop Trail are believed to be 800 to 1,500 years old. 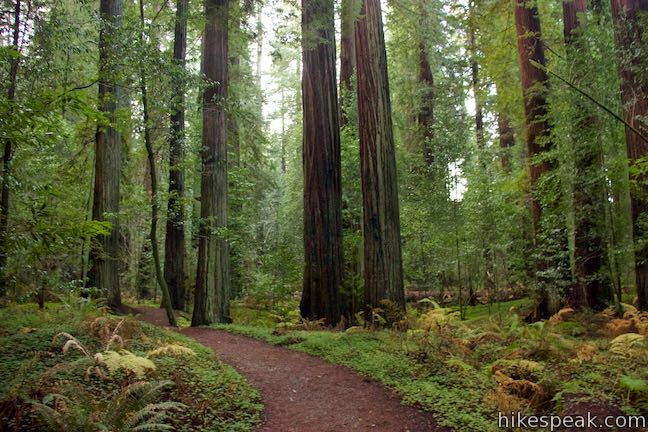 The trail curves to the right, revealing the pale side of a redwood that seems to be missing some bark. 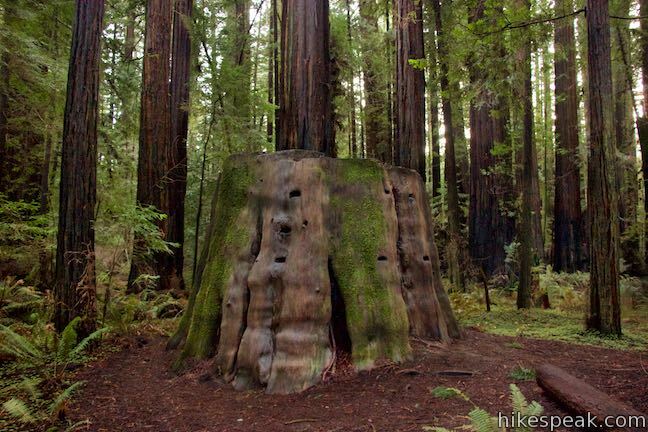 Walk on through a carpet of sorrel and pass a stump that provides a reminder of the area’s logging history. 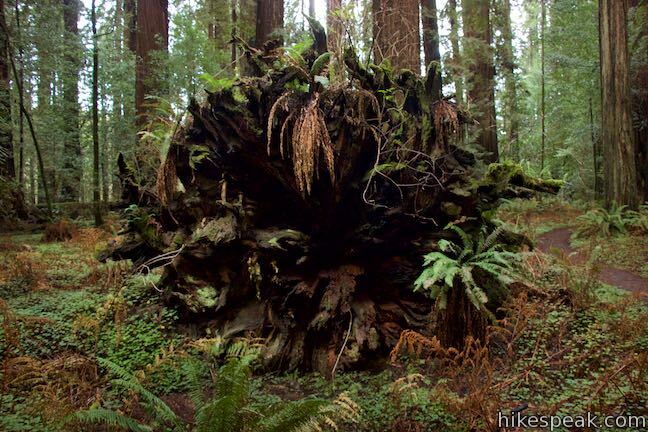 This is the only major sign of logging along the hike. 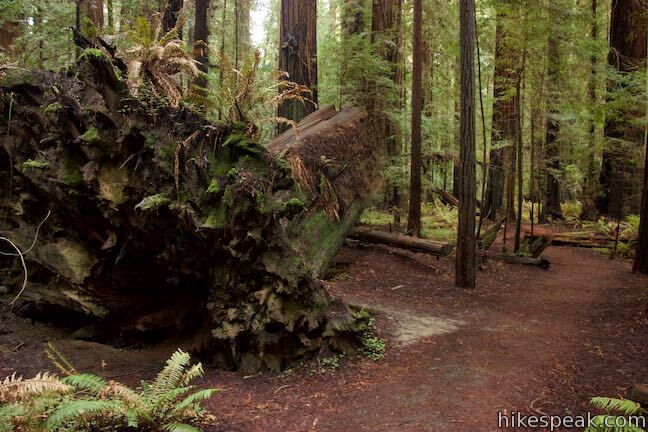 After another minute of walking, the trail slips through a cut out slice of a fallen redwood. 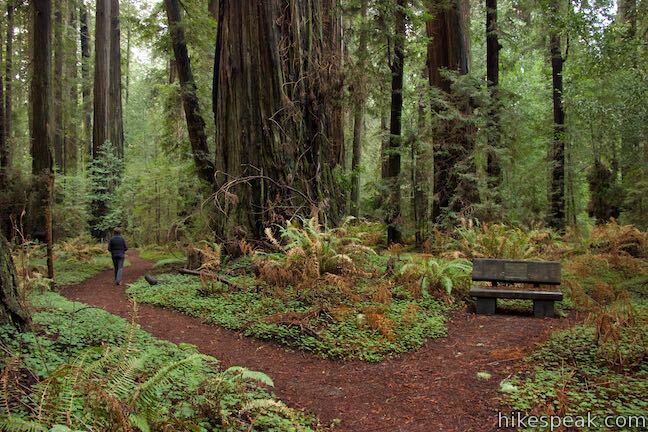 The lovely trail leads past a bench, about 0.15 miles from the start of the loop, where you can pause to take a break and admire the surroundings. 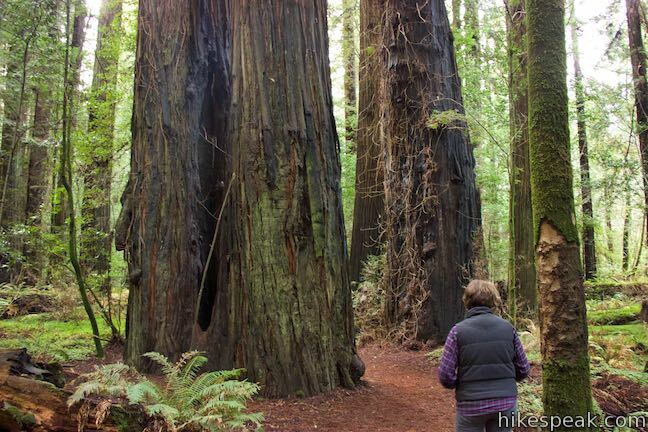 Walk through sorrel and ferns below majestic redwoods to a horseshoe bend where the trail wraps around the upturned roots of a giant redwood. 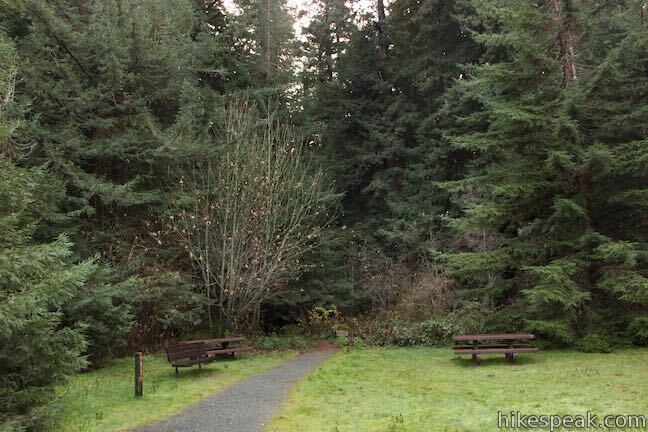 The trail passes another bench about a tenth of a mile after that. 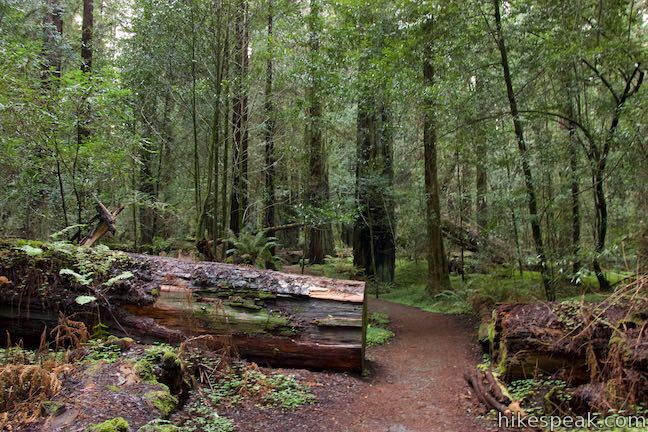 Continue on the level path as it weaves around fallen redwoods in the grove. 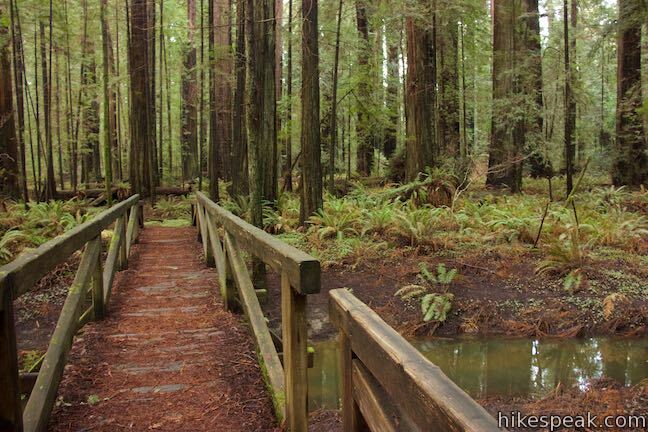 After just over half a mile on the loop, cross the first of two wooden bridges over streams that flow through the redwood grove. 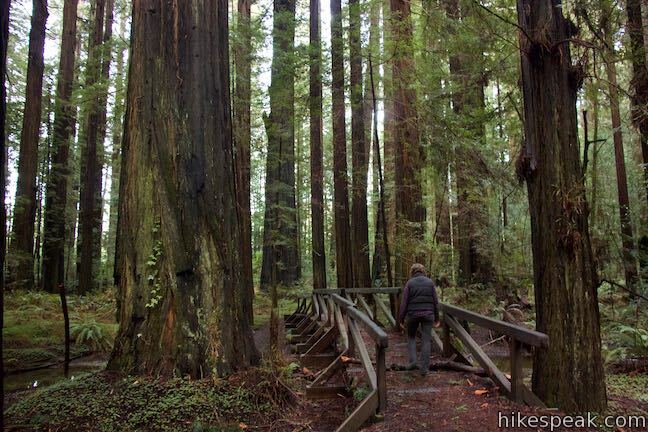 The first bridge is the longest and the second is close to the end of the loop. 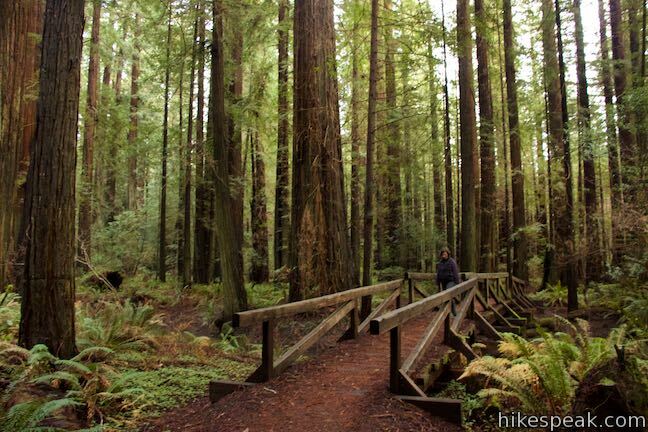 Before reaching the second bridge, the trail passes in between a pair of redwoods that crisscross above you. 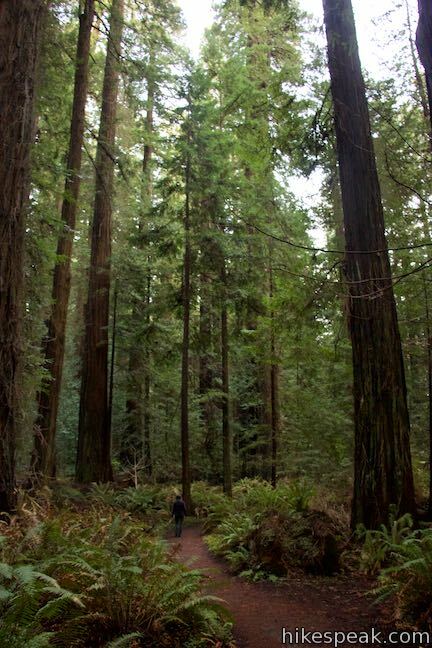 For whatever reason, each tree grew toward the other and cross far above you. 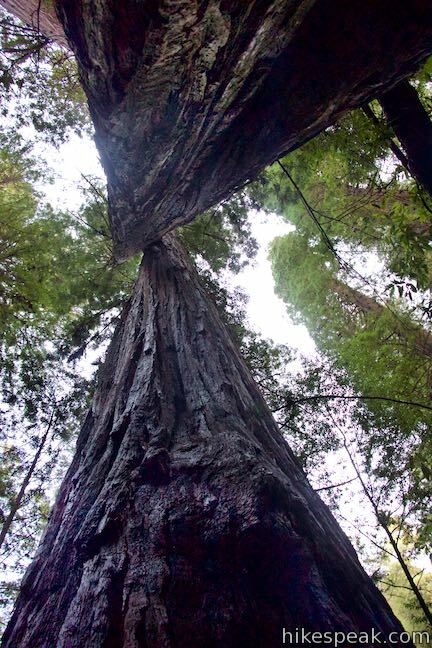 You’ve got to look up when you’re in a redwood grove! 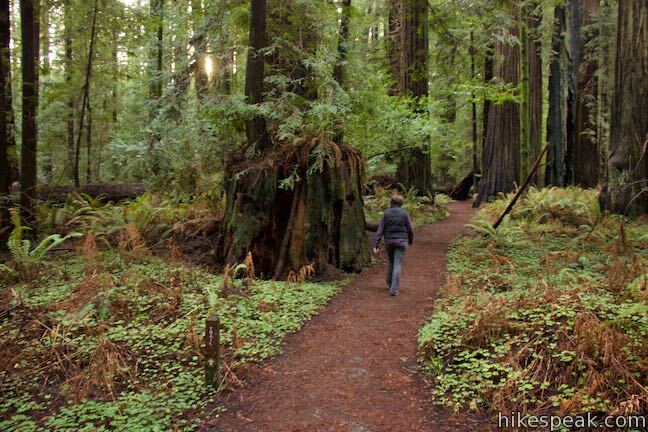 Close the loop and bear right to hike back to Avenue of the Giants. 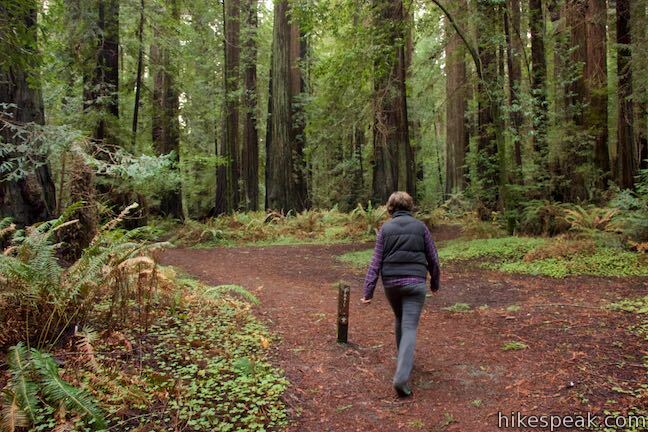 Walk 0.15 mile to the 4-way junction and continue straight through it, retracing your steps from the hike out. 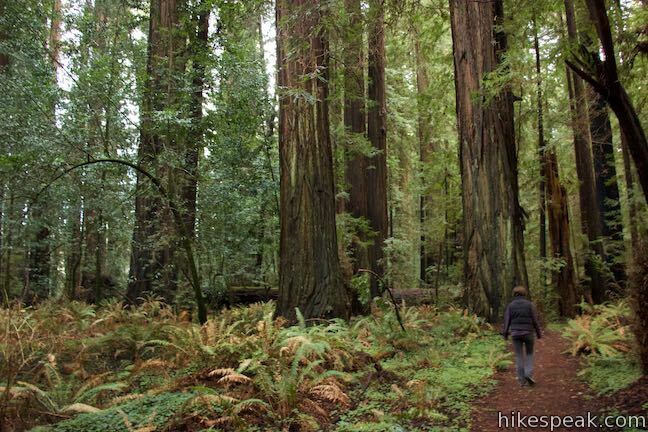 It is just under 2/3 of a mile from there back to the road. 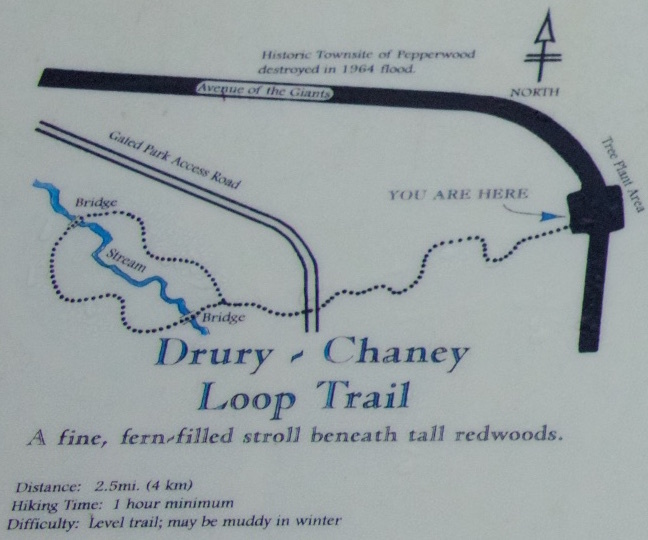 Dogs and bikes are not allowed on Drury-Chaney Loop Trail. 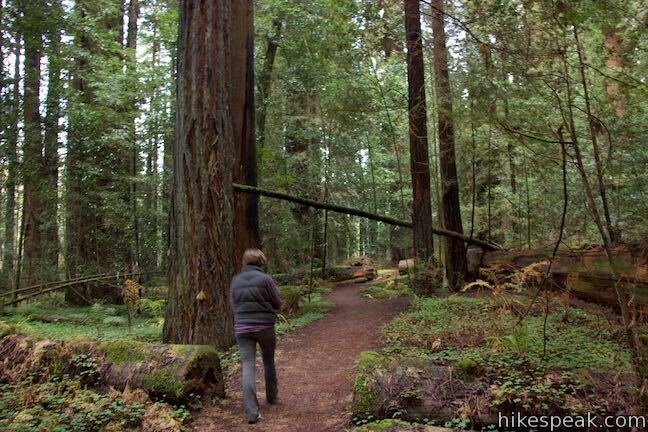 No permit is necessary for this hike in Humboldt Redwoods State Park and parking at the trailhead is free, so get out and enjoy! 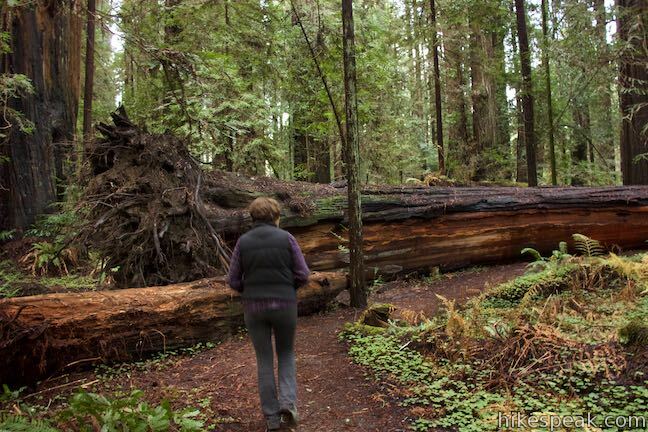 To see a nearby grove a giant redwoods that includes the partially-stripped Girdled Tree, check out Grieg-French-Bell Trail. 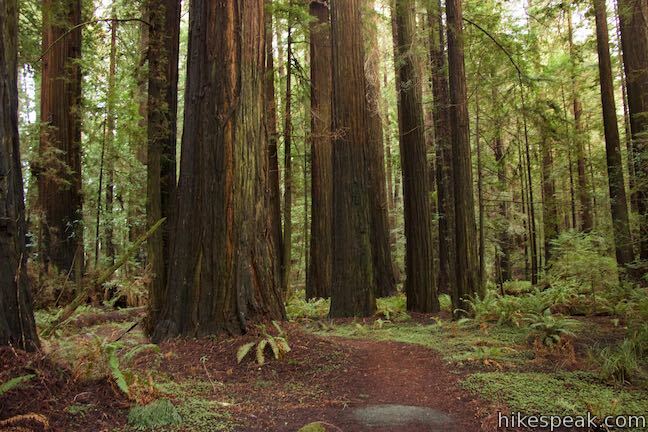 To get to the trailhead: From the north, drive 34 miles south of Eureka on Highway 101 to exit 671. 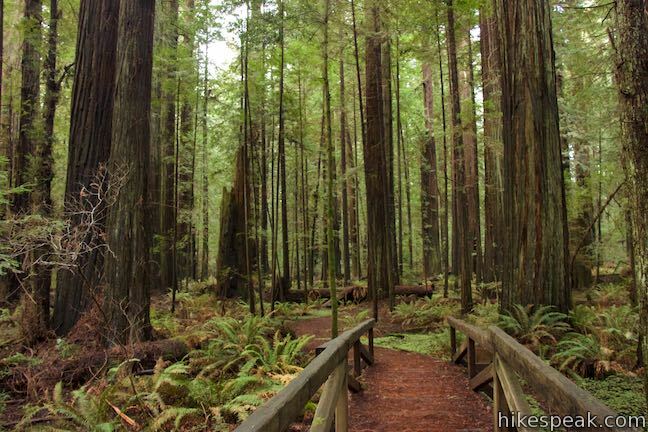 At the bottom of the ramp, make a left, cross under Highway 101, and make the next left onto Avenue of the Giants (a scenic drive that parallels Highway 101 through Humboldt Redwoods State Park). 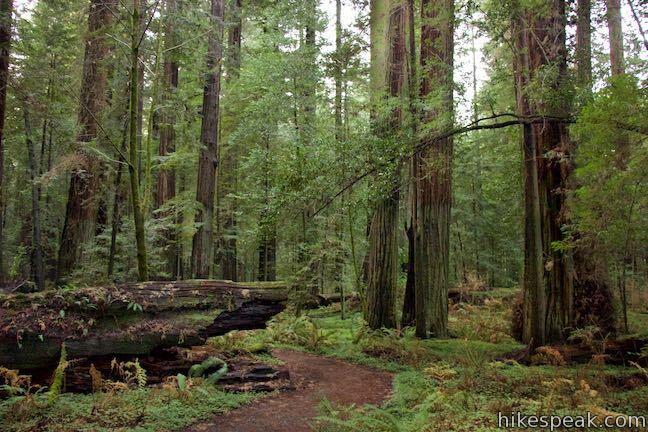 Drive half a mile up Avenue of the Giants to the trailhead and park along either side of the road. 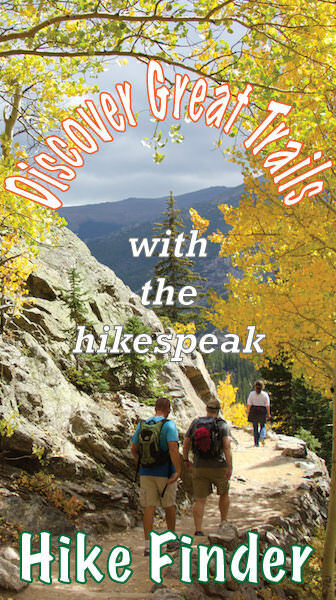 The trail begins from the west side of the road. 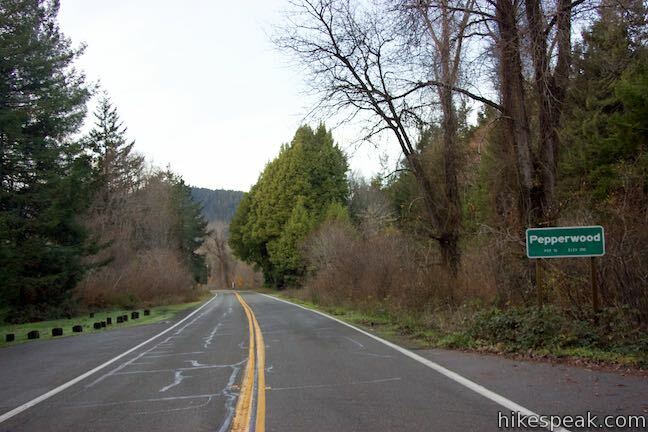 From the south, drive 51 miles north of Leggett on Highway 101 to exit 667 in Redcrest. 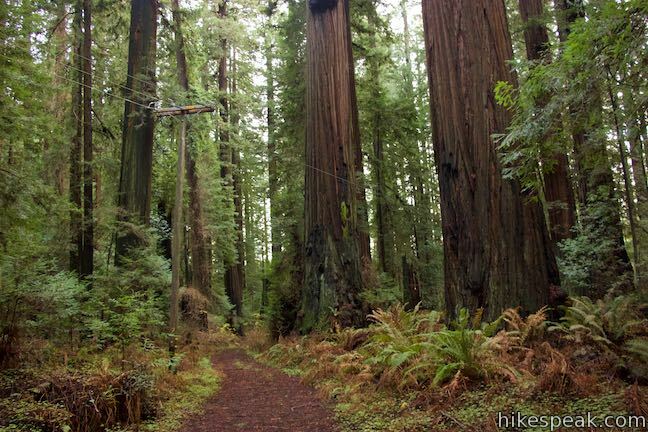 Turn right at the bottom of the offramp and make an immediate left up Avenue of the Giants. 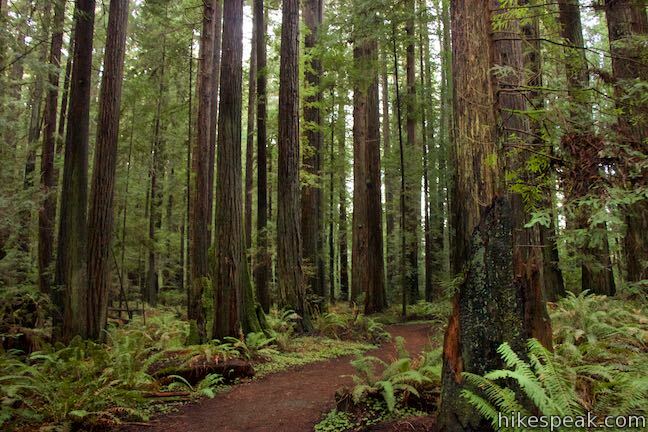 Drive 4.25 miles north to the trailhead. 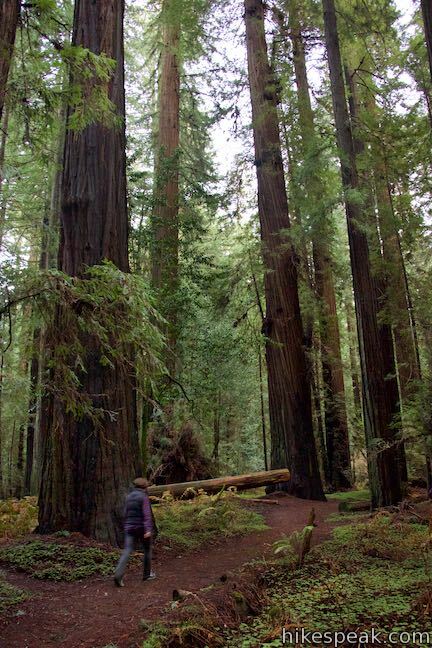 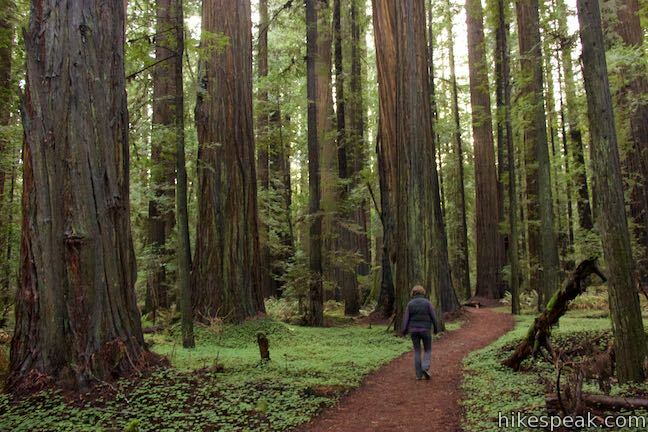 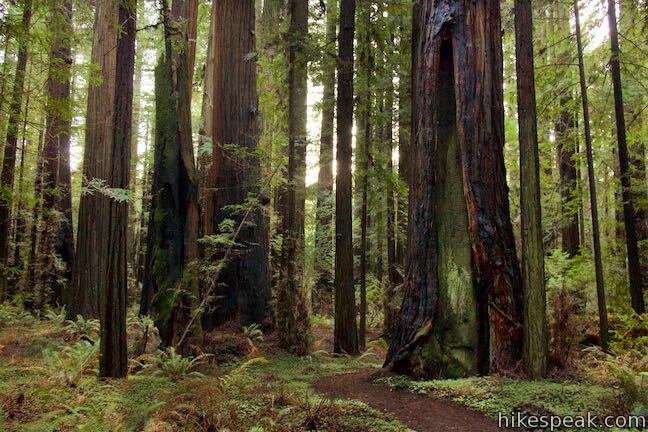 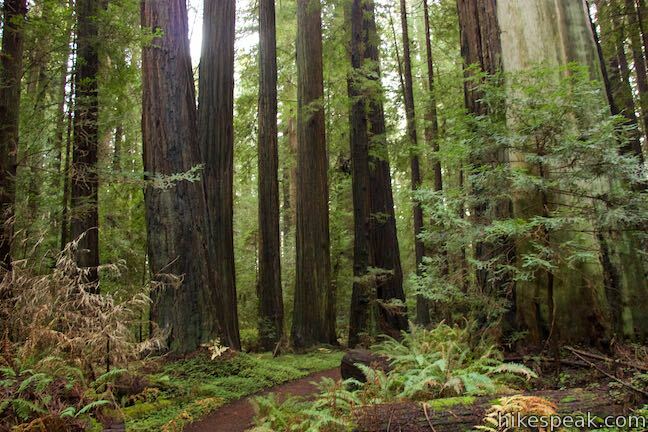 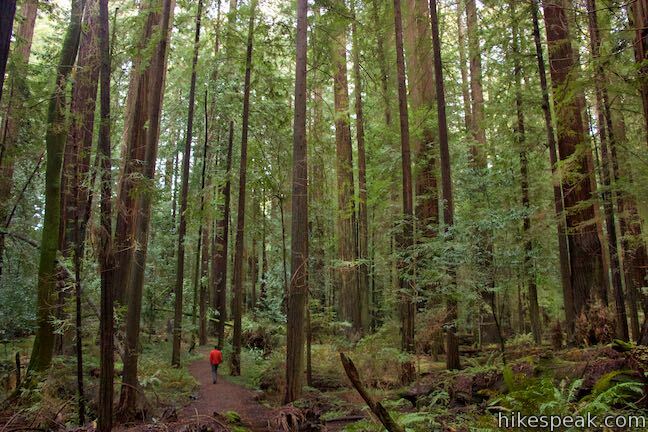 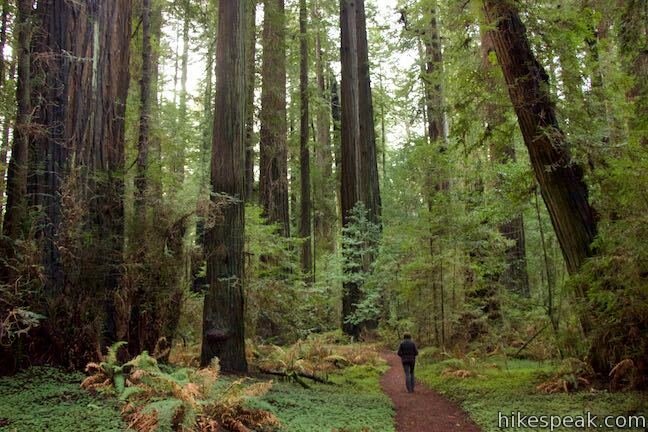 This 0.55-mile hike explores an old growth grove of coastal redwoods in Jedediah Smith Redwoods State Park.